Rupert Murdoch's trashy Sydney tabloid, the DailyTelegraph, has been slammed by the Australian Press Council over its unfair, insulting, offensive and inaccurate 'Slackers & Slouch Hats' article and misleading illustration. The Press Council has considered whether its Standards of Practice were breached by material published on the front page of The Daily Telegraph on 22 May 2014 relating to the Disability Support Pension (DSP). 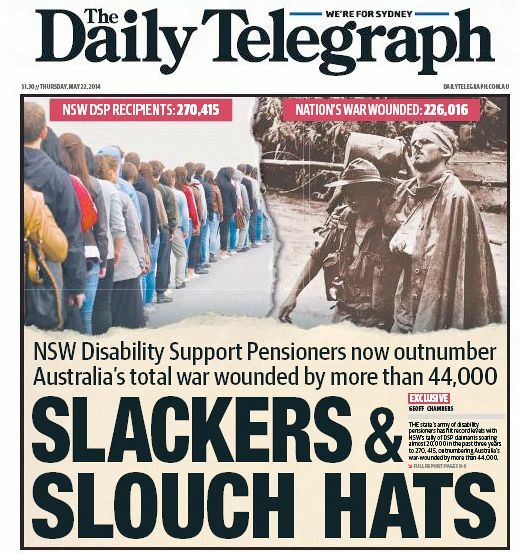 The material included a large headline “Slackers & Slouch Hats” above which was a secondary heading “NSW Disability Support Pensioners now outnumber Australia’s total war wounded by more than 44,000”. Alongside the headline was a single sentence of text reading: “The state’s army of disability pensioners has hit record levels with NSW’s tally of DSP claimants soaring almost 20,000 in the past 3 years to 270,415, outnumbering Australia’s war-wounded by more than 44,000”. Above this material were two large photographs presented in a way which reflected the invitation to draw the comparison made in the secondary heading. One photograph showed a queue of about twenty people, none of whom had an apparent disability. Superimposed were the words “NSW DSP Recipients: 270,415”. The other was a well-known and striking photograph of a severely wounded soldier being helped to walk through the jungle of Papua New Guinea during World War II. Superimposed were the words “Nation’s war wounded: 226,016”. The Council considers the headline and other material on the front page collectively imply that a high proportion of DSP recipients are “slackers” and should not be receiving DSP. The evidence provided did not justify this implication. The Council also considers the implication that a high proportion of DSP recipients are “slackers” and should not be receiving DSP was offensive to an extent not justified by the public interest. Accordingly, the Council has concluded that the headline, headings and text on the front page collectively breached the Standards of Practice relating to accuracy and fairness, and to causing greater offence than is justifiable in the public interest.